Syracuse outlasted Wyoming in 5, while Iowa registered its first road win at Iowa State since 1997. The Hawkeyes and Cyclones met as part of the Iowa Corn Cy-Hawk series. Syracuse overcame Wyoming, which received votes in VolleyMob’s latest power rankings release, in 5 sets at the Cyclone Classic Friday afternoon to notch its third victory of the season. The Cowgirls posted a better hitting percentage than the Orange (.192 to .185), but came up short of the win in the long run. In the first set, the Orange jumped ahead 8-3 and withstood a comeback drive by the Cowgirls to earn the 25-18 win. Wyoming cut the deficit to one, but were unable to take a lead in the opener. The teams battled through 7 ties before the Orange could edge the Cowgirls, 25-22, in the second set. Syracuse notched the final 5 points to secure the win. It was back and forth in the third set, which contained 14 tie scores and 6 lead changes. With the score knotted, 29-29, Wyoming kept the match alive and claimed a 31-29 win with back-to-back kills. The Cowgirls continued their comeback bid with a strong fourth set performance. They began with a 3-0 run and never trailed en route to their 25-18 win. In the decisive fifth set, the teams played through 10 ties and 5 lead changes before the Orange came up with the 15-13 win with a 3-0 closing run. Polina Shemanova (team-high 20 kills, 10 digs) and Elena Karakasi (team-high 39 assists, 11 digs) recorded double-doubles for the Orange. Joining Shemanova with double figure kill totals were Ella Saada (16) and Santita Ebangwese (11, .409 attack percentage). Kendra Lukacs logged a team-high 15 digs. Emily Lewis (21) and Reed Copeland (10) led the Cowgirls offensively, while Cori Aafedt registered a double-double with a team-high 33 assists and 15 digs. Madi Fields led the defensive effort with 20 digs. In the annual Iowa Corn Cy-Hawk Series the Hawkeyes prevailed over the Cyclones, 3-1, in Ames, Iowa. It was a historic night, as it marked Iowa’s first win on the road against Iowa State since 1997. The intrastate rivals fought through 7 ties and 6 lead changes in the opening set. The Hawkeyes earned the win with a 13-5 closing stretch, 25-20. In the second set, Iowa jumped ahead early 6-2 and held on from there en route to a 25-21 win. The Hawkeyes notched 4 of the final 6 points to go up, 2-0. Iowa State extended the match, edging the Hawkeyes 25-23 in the third set. The Hawkeyes went up 6-1 in the fourth set, however the Cyclones worked their way back into contention, tying the score midway, 12-12. 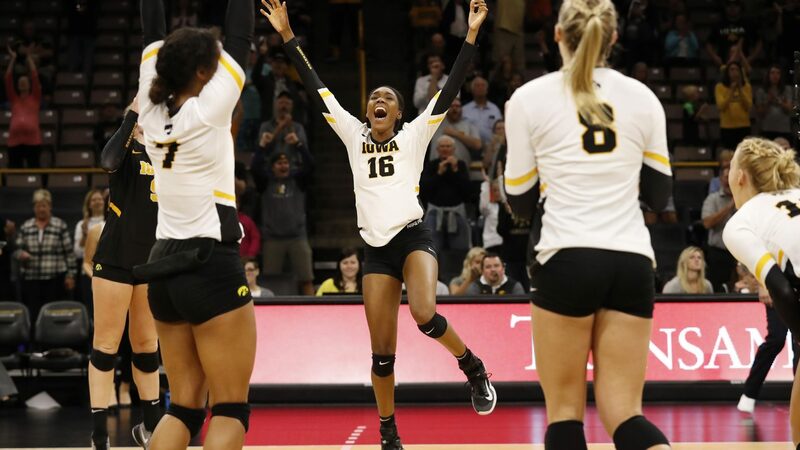 Iowa responded with a 5-1 stretch to secure the win and the 4-set rivalry win, 25-20. Cali Hoye (15 kills, 11 digs) and Brie Orr (39 assists, 16 digs) recorded double-doubles for the Hawkeyes. Reghan Coyle contributed 11 kills, while Molly Kelly logged 22 digs. Three Cyclones posted double-figure kill totals: Jess Schaben (14), Grace Lazard (11) and Josie Herbst (11). Piper Mauck notched 38 assists, while Hali Hillegas recorded 17 digs.